When Creative ZiiO 7 was first introduced, there's a stylus in the ZiiO package. A few of us here guessed correctly, the stylus is a pen for Chinese character handwriting recognition. Interestingly, the Creative ZiiO is launched and marketed in Singapore as an android tablet loaded with an educational package called PlayChinese to pick up Chinese the FUN way. It will be known as the ZiiO Shenbi tablet with PlayChinese. 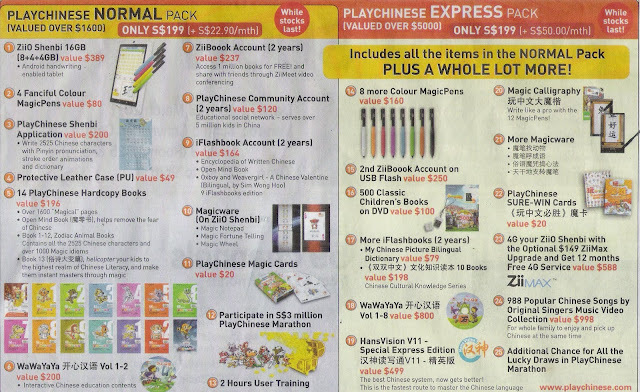 The Normal PlayChinese pack (valued over $1600) will cost you S$199 (+ S$22.90/month). The Express PlayChinese pack (valued over $5000) will cost you S$199 (+ S$50.00/month). 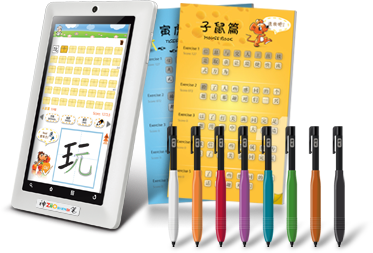 Creative Technology Ltd. today announced the PlayChinese™ Pedagogy System, featuring the new ZiiO Shenbi tablet and content applications that make mastering the Chinese language a fun and easy experience. The Chief Architect of the PlayChinese™ Pedagogy System is Sim Wong Hoo, CEO of Creative. He leads the way in pioneering a new pedagogy that will revolutionise the way people approach the Chinese language, helping to eliminate fear of the language and enabling people to master Chinese through fun and play. HansVision, a Chinese productivity software, is the super-pillar that enables anyone to enhance their proficiency level in Chinese with minimal effort. 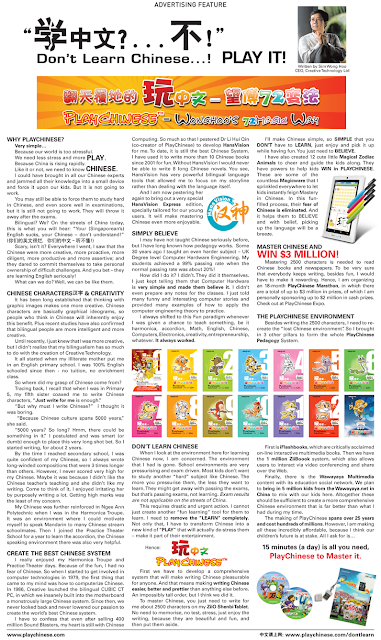 Other features of the PlayChinese Pedagogy System include the PlayChinese 14-book series in hardcopies, the PlayChinese Magic Cards and other Magicware. The PlayChinese Pedagogy System promises a "no tests, no stress" approach to mastering the language. Anyone, regardless of proficiency level, can master the Chinese language through this fun and easy system. A PlayChinese Marathon Contest will be launched at the inaugural Creative PlayChinese Expo where Sim will offer up to S$2 million in cash out of his own pocket as prize money, and participants can win up to a total of S$3 million in cash and prizes. Contest terms and conditions apply. The PlayChinese Pedagogy System will be on showcase at the Creative PlayChinese Expo during the period of 11 - 20 March 2011, from 12noon - 9pm, at Creative Resource in International Business Park. The Creative PlayChinese Expo is a 10-day long festival of innovative technologies, dynamic content and exciting showcases that are the culmination of years of research in innovative technologies. For more information on the PlayChinese Pedagogy System, please visit www.playchinese.com. if Creative can work with the MOE to add Singapore Schools Textbooks inside this ZiiO like Maths, Science and so on and make it more interactive and more illustrative than school textbooks. It will be a hit as a great learning material both within and outside Singapore especially so many foreigners are interested in study materials from Singapore. But i felt the downside is still on its passive touch screen and lack of 3G functionality which makes it very much less user friendly and less useful. If i were to choose beween iPad and ZiiO. I still prefer iPad. In comparison, learning Chinese characters are secondary and to me is not so important especially in Singapore society where the working language is English despite the rise of China. Do you learn Indian language due to rise of India too? Not so. It's not a strong point for me to just buy ZiiO alone just for that purpose. Though that software package is good, it should make it more affordable to be widely accepted and adopted. Do you think Apple store would be popular or widely accepted if its apps are that expensive? I agreed. Creative doesn't understand what the market wants and it's products won't sell. Passive touch screen is my ah-gong toy, not ah-boy or youngster toy. Its design is not appealing and everyone I know tell me you can buy anything except Creative. Everyone hates Creative and hope it gets diminish forever.